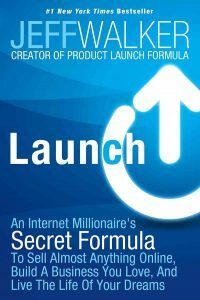 Launch by Jeff Walker explains how you can make money launching and selling an online product. I find it extremely useful. Most businesses succumb to hope marketing. They think something will be successful, finally find the courage to launch it and then they fold when the initial reaction is not as good as they were hoping for. What’s the alternative to hope marketing? A well planned approach in your launches. Scarcity is a well known principle as explained by Cialdini in Influence. The author says a good way to use the scarcity is to say that your product’s price will rise very soon. For example, you could offer a pre-launch price for a limited time only. Sequences are a great way to build excitement towards the last piece of the sequence. Think about Harry Potter: what was the book that had fans the most excited about? It was the last one. Think if you can set your product at the end of a series of sequences. Stories sell much better than empirical data. So when you devise your marketing strategy, make sure you do it telling great stories. Whatever you do, Jeff Walker says that your mailing list is the most important asset you own. He introduces the idea of a squeeze page, such as a page where users must either leave their email or leave. But I personally find it a bit too aggressive. The name of game here is piquing interest and getting early feedback before you even start working on the product. Don’t seem like you’re selling or you will turn people off. The author has a great tip on hos to structure the email for the feedback, and I invite you to get the book for the details. Release high quality content. First part why they should care, then what your content will do for them (use a story/case study) and then how your product will help them. The last part should tell prospects how much they can expect to wait and the sweet deal you’ll give to the very first customers (scarcity). I particularly liked the idea of the joint venture launch, such as partnering with people in your industry to access their own list. You should prove them that your product sells first (do an internal launch to your list first) and offer them something (a commission on every sale, for example). Link up with people in your space. Don’t just think of them as competition, think of how you can work together. Plan your launches. Get early feedback, then build suspense, then release on a market that is already ready to buy. Some of the mental triggers Launch recommends are well known and everyone is already using them. As a matter of fact, am I the only one who’s put off by ads with a “limited time only” sticker? To me it reads spammy right away and makes me not want to buy a product. The ideas of getting early feedback, planning and preparing your market are all solid concepts. I’m not (yet) an expert on online marketing so giving a major recommendation at this point would premature for me. But as a newbie, I definitely did find lots and lots of value in Launch by Jeff Walker. And as of now, I can only recommend it.